We popped over to my BFF's apartment last night to help her hang up some stuff on her walls. She wanted an eclectic gallery wall above her red sofa using all the artwork and photos she has collected. You may remember the red sofa– I talked about it here. When she first moved into this place, I made this little inspiration board to get ideas for refreshing the sofa and making it work with her style. The funny thing is, she totally loved those curtains and had already pinned them to her Pinterest boards way before I came up with this, so we decided she had to buy them. They are totally gorgeous and high quality in person, by the way. She's still looking for the right curtain rod, so we haven't gotten to hang them just yet. Anyway, back to the gallery wall. It looks very cute, if I do say so myself. We didn't buy anything new– just created it out of things she already had. Hanging stuff on the walls makes such a difference when you've first moved into a new space– it really helps the rooms to feel cozy and personal. Sorry about the photo quality– I snapped these on my iPhone as we were leaving, and it was starting to get dark. The touches of aqua on the wall and in the pillows really help balance the red on the couch. There are many schools of thought when it comes to gallery walls. Some people prefer straight lines and a clean grid of pictures, while others like to hang them casually like we did in her living room. 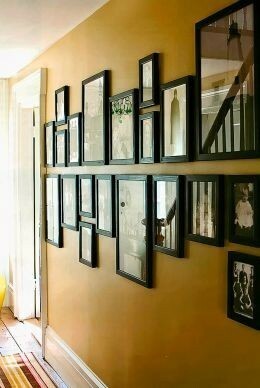 Beyond the arrangement on the wall, you also have to consider whether you want the frames to be the same or different. In Kelsey's living room, we used a wide variety of frames. The mix and match style creates a relaxed space. We have two gallery walls at our house, and I have used black frames for each because that's my favorite look. It probably stems from high school and college art exhibit days where we always used black mats to frame our work. Plus I think the black frames really pop off our grey walls. I do have one gallery wall with mixed frames in one of our guest rooms, and it feels less formal than the others. I like it just as much as the standard black frames, but it has a different vibe. Do you prefer casual gallery walls or something more formal with clean lines? 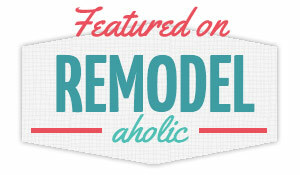 And do you prefer matching or mismatched frames in your gallery wall?